And so, that was the end of the Christmas recipes. But not the end of the baking. I had a break for a couple of weeks, but was back to it by mid January. My first bake was battenberg cake – not something I would normally think of baking, but I was inspired by the baking calendar my parents had bought me for Christmas. Nothing about this was particularly special. 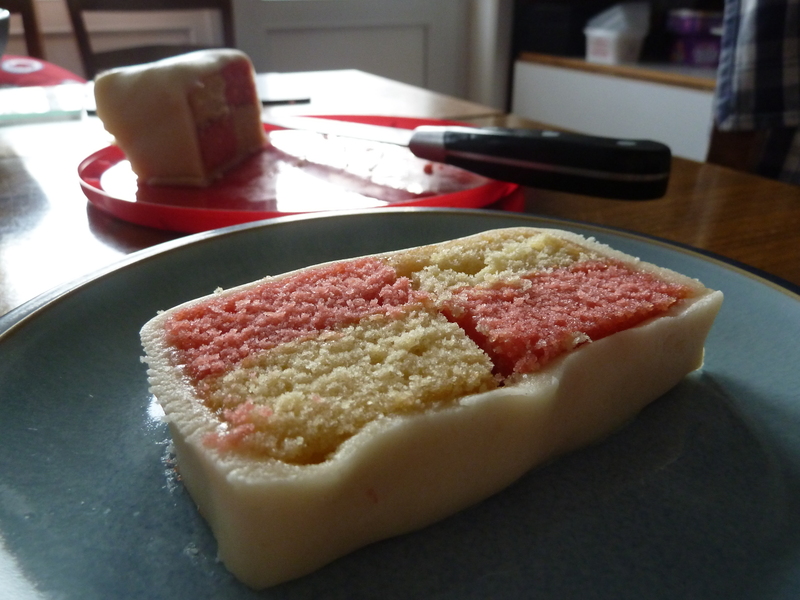 It tasted OK (like most battenberg cakes do), and it was OK to bake, but a bit of a faff for the final result. Contrary to popular belief, it’s not really the colouring of the cake that’s the faff – that just involved splitting the batter in half and adding pink food colouring to one half. The faff is in cutting up the cake to make the different coloured squares once the cake has been baked. This worked OK, but I probably had more of a split in the middle of the cake than I really should have. Covering it in marzipan also didn’t work as well as it could have – it looked alright, but I didn’t wrap it quite as tightly as I should have. This isn’t something I’m likely to make again – the reward isn’t worth the effort, and you do waste a lot of cake cutting it into the right size and shape squares. The fact that Dan and I happily ate the extra bits in one sitting is, of course, irrelevant. This is the title of one of the cocktails in Nigella’s Christmas cookbook. 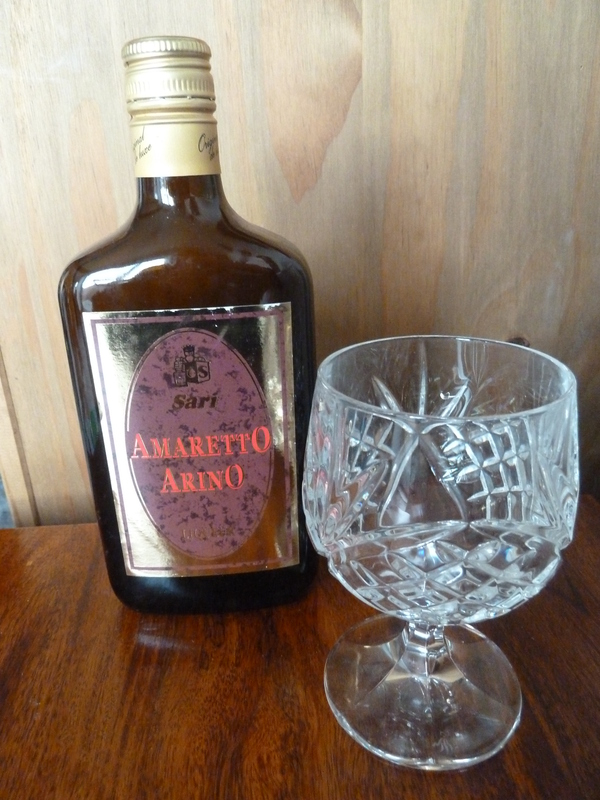 It sounds lovely (if strong) – just a mix of brandy, amaretto and Cointreau. Well, it’s not. It’s far too strong and far too sweet for my liking. There’s not a lot else to say about this – I had to mix it with Coke, and it was still way too strong for me. And I like my alcohol. If you know me, you know I’m not shy about my drinking. But I don’t want this again. I’d be much happier with a plain old glass of brandy. Or whisky. Or wine. Or anything else really. 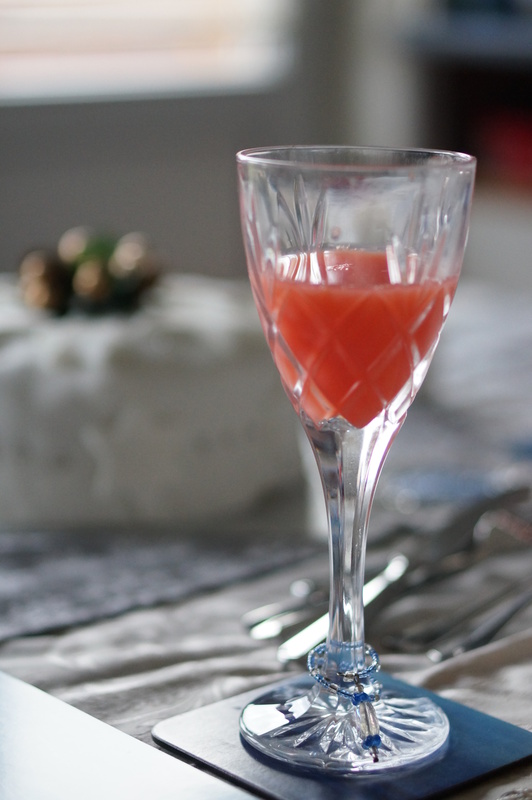 This is one of the mocktails from Nigella’s Christmas. 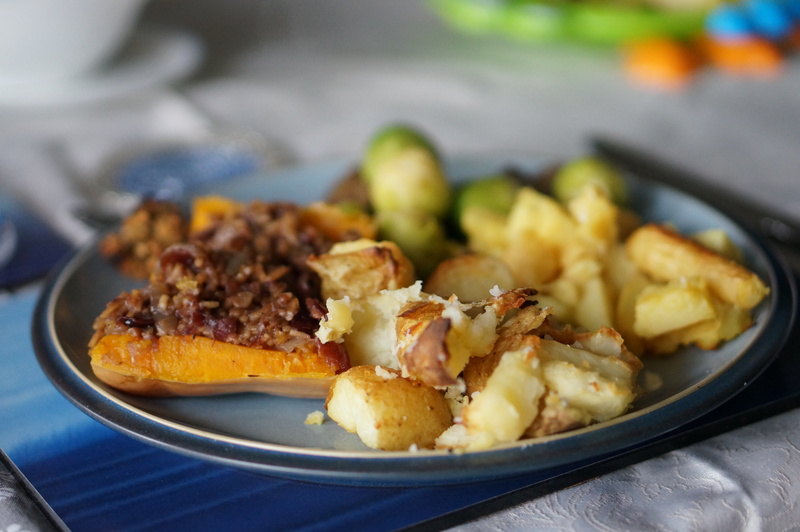 As we were having our Christmas Day at home with our young son, we didn’t want to drink too much alcohol too soon. So a mocktail seemed like a good drink to go with our Christmas lunch. Pussyfoot consists of pink grapefruit juice, orange juice, lime juice and Grenadine. Whilst it was fun to mix together, I can’t say I was overly keen on the taste. I’ve never been a big fan of grapefruit juice, and this didn’t really change my mind. The recipe book suggests adding vodka if you’re not particularly pro mocktails; I have a suspicion this would have improved the taste. But I’d still be much, much happier with a glass (or jug) of Poinsettia. 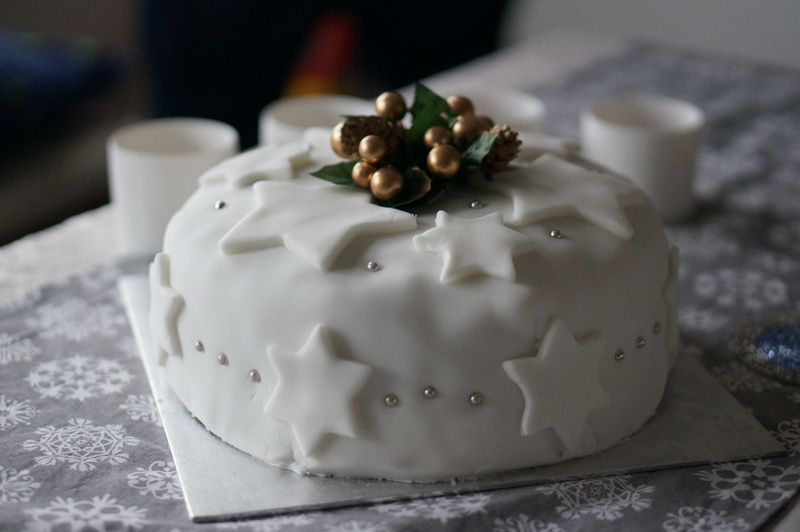 The first of the Christmas-themed bakes was as, Nigella labels it, a Traditional Christmas Cake. In many ways, she’s not wrong. It involves baking it at least 3 weeks in advance (so you can periodically feed the cake with brandy, or whatever alcohol takes your fancy), covering it with marzipan and then icing it a week later. However, in other ways this cake veers away from the standard Christmas cake I would normally bake. There are a lot less dried fruits in this (just raisins, currants and glace cherries – and lots of them. The recipe also calls for pecans or walnuts, but I’m not a massive cake and nut fan so I left these out), and a lot more alcohol than I’m used to adding (400ml for a 23cm round tin). However, the end result is pretty good. Surprisingly, it doesn’t taste too boozy, and you don’t notice that you’re only really eating a small variety of fruit. I guess once the marzipan and icing are added to a Christmas Cake, they are a pretty big feature of it. Nigella’s Christmas Cake is no easier, or harder, to make than most traditional Christmas Cakes, and tastes just as good. 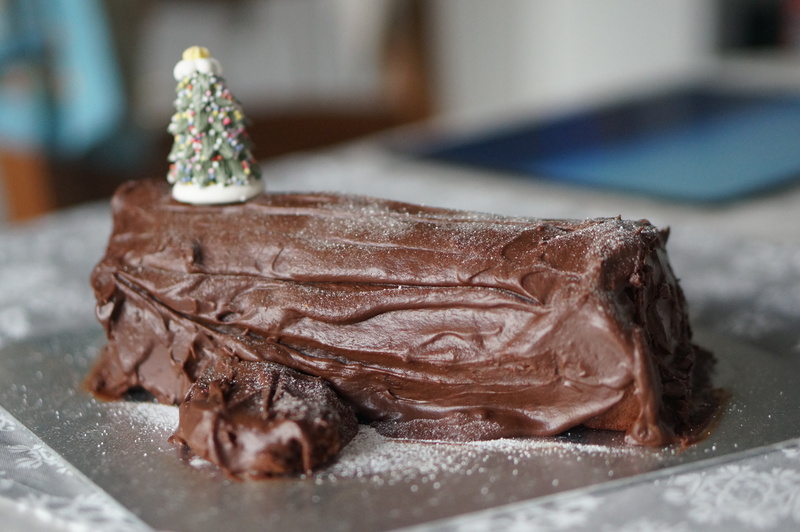 I’m not sure it would replace the standard Christmas Cake I make – but that’s not because it doesn’t taste as good. It just doesn’t really taste any better, and I enjoy making other varieties of the cake a little more as I love mixing all the fruits together. But if you want to do something traditional and make it slightly easier on yourself, this isn’t a bad choice at all.